/ Has Australia Gone To The Dogs??? While there may not be a greyhound race that stops the nation, but 600,000 Australian adults bet on at least one greyhound race during the year—and, despite the scandals and controversy, this average doggie bettor is around eight years younger than the average horse race punter, so says the latest consumer gambling data from Roy Morgan Research shows. 3.3 million Australian adults (18.0%) gambled on at least one horse race (excluding harness trots) in the past year, and their average age is almost 49—a bit older than the national mean. But among the 3.2% who bet on Australian greyhound racing, the average age is not quite 41—younger than the average Facebook website visitor, The Bachelor Australia viewer, or The Man from U.N.C.L.E movie-goer. 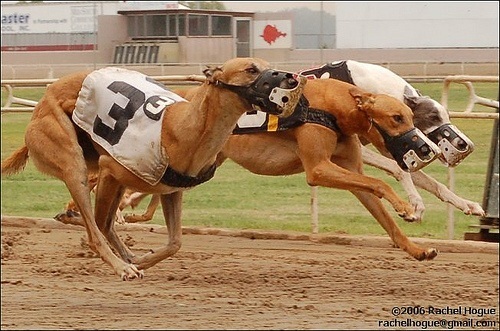 Much of the lower age average is driven by the overwhelmingly popularity of live greyhound racing among 25-34 year-olds. This group is 80% more likely than average to bet on dog races during the year, and make up the largest bloc of greyhound bettors (34.2%) despite being less than a fifth of the population. As shown below, the age profile of greyhound bettors is a virtual mirror of horse racing: only around one in four greyhound gamblers is aged 50 -plus, compared with almost half of horse racing bettors—but the reverse is true for those aged 18-34. Those in the middle, aged 35-49, make up around 30% of each bettor group. “Betting on horse-racing has declined in popularity over the past decade: In 2005, 24% of people bet on at least one horse race; in 2015, around 18% of us did.“Greyhound racing, meanwhile, seems to be on-trend—and last year’s live baiting scandal, revealed on Four Corners in February last year, had only a marginal effect on betting incidence. 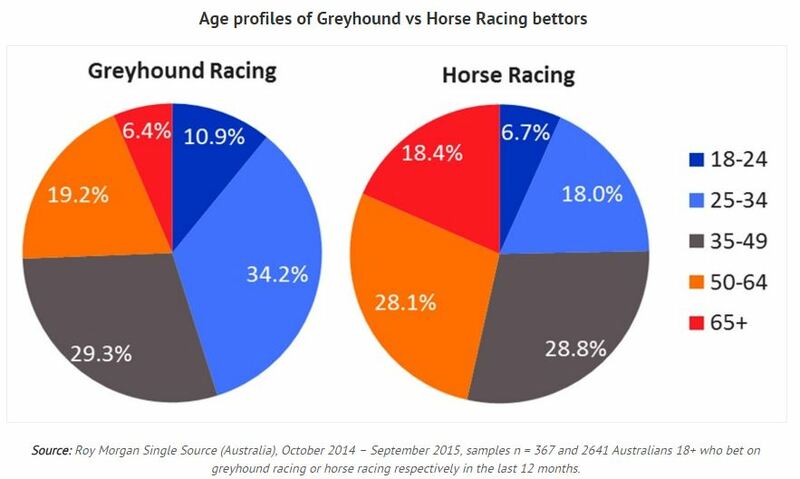 Not only has its popularity been consistent over the past decade, but Aussies aged 18-34 now make up only nearly half of greyhound bettors, compared with only a quarter of horse-racing bettors. “But it’s not just this generational difference that suggests greyhound racing is trendy: by far the most likely Values Segment to bet on greyhounds (at rates well over double the norm) are those defined as ‘Look at Me’: a niche group of social butterflies who participate in cool or outrageous activities with the in-crowd of their peers, who follow trends and want to clearly distinguish themselves from previous generations.